Learn piano or music theory, online or in person, with a fully qualified tutor - based in Burnham on Crouch. Ruth is a skilled, knowledgeable, patient and encouraging teacher. It's a pleasure to have lessons with her, especially as I am returning to the piano after decades of neglect! She brings so many aspects of her knowledge and musicality to lessons, not just technical know-how and teaching ability but her passion for music too. I am a fully qualified graduate piano teacher aged 42. I have been teaching privately full time since completing my music degree in 1999 (BA honours music, speciality piano). I taught part time for six years before that (since gaining grade 8 piano at the age of 16, and then music A level). At the same time I worked as an accompanist for ABRSM graded exams. I am a Fellow of The Incorporated Society of Musicians. I am also an ISM registered private teacher. I have completed the NSPCC child protection training course. DBS checked - enhanced disclosure. I do online tuition or home visits. I provide personalised video demonstrations, instructions, and sheet music. I mainly cover Brentwood, Shenfield, Billericay, Ingatestone, Maldon, Danbury, Wickford, South Woodham Ferrers and around the Dengie Peninsula - including Althorne, Mayland, Maylandsea, Southminster and Latchingdon. If I haven't listed your location, please ask if it is one I am able to travel to. The ability to repeatedly review lesson materials - with live lessons instructions/demonstrations are often forgotten or misremembered. Students find it incredibly motivating to regularly record their playing and share those recordings with the teacher. Easier scheduling and much lower cost than in-person lessons. I also teach via Skype or FaceTime. In my experience children often find these sorts of lessons fun and motivating, and adults find them more convenient and affordable. First online piano lesson by video exchange free. 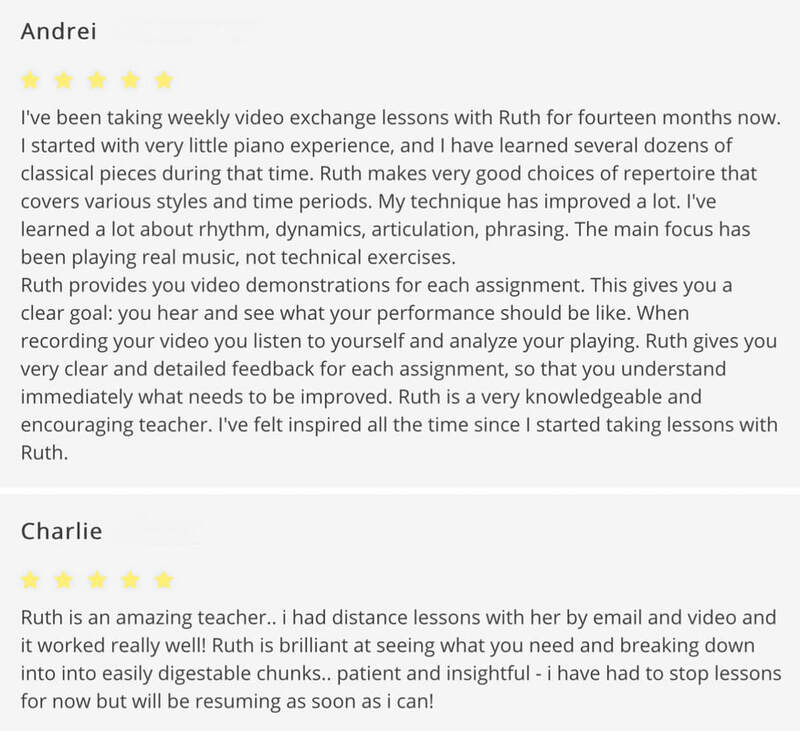 I am confident that my online piano lessons will work for you, as the results have been consistently good - try it for yourself free, and you will be convinced too. Read more about how piano distance learning works here: Online piano lessons. Another review from one of my online piano students. Click to read more reviews. Learn for pleasure or take exams. ​Whether students take in-person tuition or online piano lessons, I prepare them for all grades of ABRSM exams, and I have an excellent record of exam results. I cover every aspect of training for the exam syllabus. This includes aural tests (ear training); sight reading; scales, arpeggios and broken chords; and the pieces. I also teach people who just want to learn for pleasure. ​I teach all styles of music, not just classical. Whether you want to focus on classical/ pop/ jazz/ folk etc, or you prefer to play a mixture of styles, I tailor the lessons to suit you. I include music theory as part of the learning process because it is an important aspect of mastering any instrument, and I prepare students for ABRSM theory exams, as well as any other exam board, any grade. I am also happy to provide sessions or courses focused solely on music theory. I offer the option of either in-person or online music theory lessons. My online music theory lessons involve tuition by email; a marking service; and bespoke correspondence courses. I teach children and adults, all ages are welcome, and I am very patient whether you are a complete beginner or advanced. Adult learners benefit most from my online lessons, as they are much easier to fit into a busy schedule. In the video below you can listen to a piece I wrote for piano, derived from an ancient Irish air. You can buy the sheet music for that and other compositions/arrangements of mine, designed to improve technique and musicality on the piano here. In the next video you can listen to my own arrangement of a beautiful ancient Irish folk song called Ned of The Hills, which I wrote for piano. You can buy the sheet music for this arrangement here. The maps below show the general region of Essex covered by home visits - from Burnham on Crouch to Brentwood and the areas in between. Have a look at the maps to see if you live near or between these towns. Alternatively you are more than welcome to send me a message and ask if I cover your area. Any questions? Send me a message, I would love to hear from you.